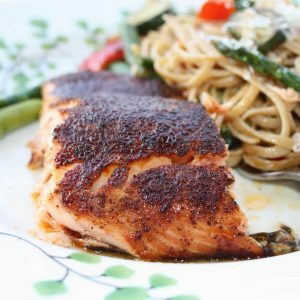 Salmon with sweet spicy rub is an easy, healthy broiled salmon that is packed with bold flavor! This easy salmon recipe is the perfect way to introduce salmon to your family! Full of flavor, packed with protein, and easy to make! Preheat broiler and set oven rack down about 6 inches from top. Spray your sheet pan with cooking spray and place salmon, skin side down on pan. Combine brown sugar, chili powder, cumin, salt and pepper in small bowl. Drizzle each salmon fillet with 1/2 teaspoon of oil, then rub fish with spice mixture, distributing evenly. Broil in oven for 8-10 minutes, depending on thickness of fish. Remove to a platter and serve immediately. Coat your grill or a grill pan with cooking spray and preheat over medium heat. While the grill is heating, combine the brown sugar, chili powder, cumin, salt, and pepper. Brush each salmon fillet with 1/2 teaspoon of the oil, then rub each fillet with about 1/2 tablespoon of the spice mixture. Grill the salmon, flesh side down, until charred, 4 to 5 minutes. Flip the salmon and cook another 5 to 6 minutes for medium doneness. For well done fish, cook an additional 1 to 2 minutes.